SIR Julius Chan played a pivotal role in shaping Papua New Guinea’s first 40 years of independence. 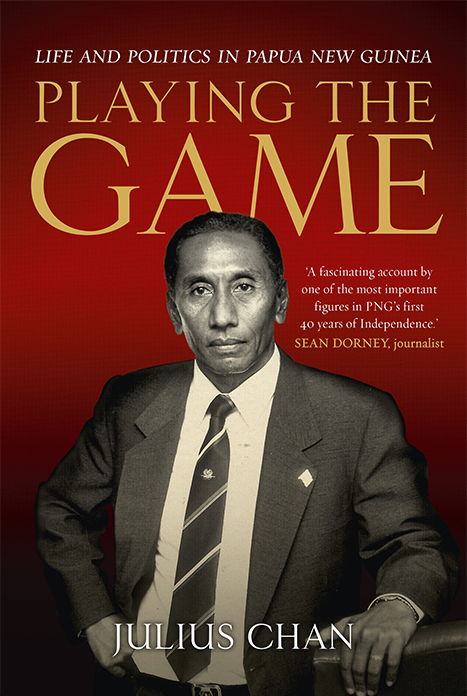 Playing the Game is his fascinating account of the exciting birth of PNG as a nation, and the challenging years that followed. It is also the story of a man who grew up with a fight-to-win determination, shaped by his humble upbringing, and his formative years at one of Brisbane’s leading Catholic colleges. Mr Chan rose to become PNG’s Prime Minister, not once but twice – an incredible feat of grit and endurance. He was deputy leader four times and held the Foreign Affairs and Finance portfolios. In early chapters, we learn about young Julius Chan, born on the idyllic New Ireland, and brought up “between two cultures” by a strict Chinese father and a caring PNG mother. He was raised as one of 13 brothers, sisters and cousins and didn’t receive any formal schooling before he was 10. Mr Chan’s father had great hopes for his son, as a businessman, and so young Julius was packed off to boarding school in Australia. He was sent to Brisbane’s Marist College, Ashgrove. He describes his high school years there as “probably the best years of my life”. “We came to a strange land, not knowing anybody,” Mr Chan wrote. “All the boys knew we did not belong, but they looked after us and treated us like kings. Mr Chan loved rugby, and it was playing for Marist’s First XV that his win-at-all-costs attitude came to the fore. Taking decisive action to win is a central theme of Playing the Game. Mr Chan faced many challenges in business, politics and his personal life. He always stepped up to fight. “My upbringing had taught me that if there was a mountain to climb I must go up it, if there was a hurdle to jump, I must cross it,” he wrote. Mr Chan finished high school and started studying at the University of Queensland. However, a motorbike accident and a dispute with his father cut his studies short. He returned to PNG and decided to try the public service, where his talents were soon seized upon despite moments of race discrimination within the bureaucracy. He offers an interesting snapshot of the times – of the self-styled Australians who ran PNG affairs before independence, and maverick businessmen who built up and presided over lucrative empires. He describes how he learnt about politics, slowly at first because politics was not something he had encountered in his simple life in New Britain, or as a teenager in Brisbane. But he was determined to stand up and give voice on behalf of his people. His first election campaign slogan was “Chan is the Man”; which proved enough to win him a seat in PNG’s legislative assembly. Playing the Game gathers pace as Mr Chan became one of the leaders steering PNG towards independence in 1975. Six months before the handover, when Mr Chan had risen to become PNG’s Finance Minister, he was trying to decide whether to stick with the Australian dollar or introduce a completely new currency for PNG. “Thinking about the best way forward on this issue was very much like playing rugby for Ashgrove – at times I had to decide whether I should go alone or pass the ball, whether it would be easier to sidestep or make a try,” he wrote. “Those days at Marist College helped a lot in my role as finance minister. Mr Chan chose to introduce the kina as the PNG currency. It was bold move, which proved financially successful and gave a new nation a clear sense of identity. It was perhaps Mr Chan’s strongest legacy. Julius Chan first became prime minister on March 11, 1980, succeeding the country’s first prime minister, Michael Somare. He served as prime minister until 1982, when Mr Somare regained the position. Playing the Game provides some candid, at times comical, descriptions of the cut and thrust at the top of PNG politics. “(Michael) Somare attracted people a lot because he could speak very persuasively, in a conciliatory, almost musical way,” Mr Chan wrote. “He could throw a few nice half-truths in between the political gimmicks and people would fall for them. Playing the Game also contains observations about Australian leaders from prime ministers Gough Whitlam to John Howard, up close and from Mr Chan’s PNG perspective. These observations are not always flattering. Whether as prime minister, cabinet minister, or on the opposition benches, Mr Chan was outspoken on the biggest issues that were challenging a young PNG. The pressures of leadership really start to mount when the self-styled Bougainville Revolutionary Army seized the Panguna Copper mine and PNG was thrust into conflict against separatist guerillas. Mr Chan makes some candid admissions about the actions taken by successive PNG governments which exacerbated hostilities on Bougainville, making it increasingly difficult to step away from a bloody, ongoing war with the BRA. In 1997, during a second term as prime minister events turned dangerous when Mr Chan’s government entered into a multimillion-dollar contract with Sandline International, a mercenary organisation, to counter the separatist fighting. The so-called Sandline affair resulted in immense public protests and a 10-day mutiny by the underpaid PNG army. An inquiry into the affair caused five ministers to resign. The Parliament defeated a motion calling on Mr Chan to resign. However, the next day, Mr Chan and two ministers chose to step down, and John Giheno, a member of Chan’s party, became acting prime minister a day later. Mr Chan regained the leadership, shortly before national elections in June 1997. He was defeated and succeeded as prime minister by Bill Skate. Mr Chan lamented that he became PNG’s first prime minister to lose his seat. He remained out of Parliament for a decade, but he did not lose his fighting spirit. Mr Chan won the New Ireland provincial seat in 2007. It is clear that Mr Chan has become disillusioned about politics and the corruption that has come to plague government and business dealings in his country post independence. “The gap between rich and poor that we are always talking about in Papua New Guinea is continuing to expand,” he wrote. In his later life, Mr Chan, the politician, is now fully focused on provincial government. “I have given the best I could and I am still working now as hard as I worked 40 years ago,” he wrote. Mr Chan even muses about independence for Bougainville and he would perhaps support the same for his native province, New Ireland.